The suicide bomber who killed seven CIA officials and a Jordanian military officer last week in Afghanistan was a Jordanian double-agent, a former U.S. intelligence official told CNN Monday. Your take: Delay parliamentary elections? Parliamentary elections in Afghanistan are scheduled for May 22, the country's Independent Election Commission announced this weekend. Critics say the date does not give the country enough time to implement reform and put checks in place, after the August 2009 presidential elections were marred by violence and allegations of corruption before Hamid Karzai was declared president. The date announcement comes the same weekend that the Parliament rejected 17 cabinet members proposed by Karzai. The rejection of 17 proposed cabinet members will not stop international community donations or the U.N. mission to Afghanistan, said U.N. spokesman Aleem Siddique at a news conference Monday. He said the United Nations is prepared to help with Afghanistan's upcoming parliamentary elections if asked, he said, adding there had not yet been a request. What do you think? Do you think Afghanistan should delay the parliamentary elections over fears of possible fraud and violence or should the nation go ahead with the vote? Afghan President Hamid Karzai should submit a new Cabinet "within days," a U.N. spokesman said Monday, after parliament rejected most of Karzai's original nominees Saturday. The delay "will not be useful for the country," but the United Nations respects it, U.N. spokesman Aleem Siddique said at a news conference Monday. Afghanistan's parliament rejected 17 of Karzai's 24 Cabinet nominees Saturday, votes that came at a crucial point in his fight against corruption and his quest for legitimacy in the eyes of both his nation and the world. Karzai presented the Afghan parliament with 23 of the 24 nominees on December 19. Another nominee was presented later. A controversial British Muslim cleric is threatening to stage a march through the town that receives the bodies of British war dead as a protest against the war in Afghanistan, drawing a fury and outrage. Anjem Choudary has accused soldiers of "murderous crimes," and said the United States and United Kingdom are seeking to "establish their own military, economic, strategic and ideological interests in the region." British and American troops are suffering "depression" as they realize "there is no real moral or ethic (sic) reason for them to murder innocent men, women and children to fulfill their politicians (sic) agenda," according to the preacher. His organization proposes to parade empty coffins through the streets of the English town of Wootton Bassett, where the bodies of British war dead are traditionally brought when they return to the country. Relatives and friends line the streets of the town along with local residents as hearses carry the flag-draped British remains, in scenes of public mourning widely reported by British media. Choudary has not announced a date for his planned march and local police said Saturday he had not contacted them about it, as people planning marches are required to do before staging a demonstration. What does winning look like in Afghanistan? Editor’s Note: U.S. Army Cpt. 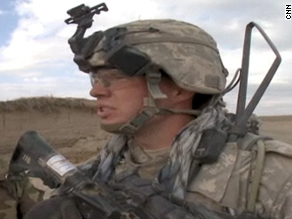 Brandon Anderson is a Company Commander in 5/2 Stryker Brigade Combat Team, deployed to southern Afghanistan. A 2003 graduate of West Point, he is a combat veteran of Iraq and Afghanistan. The opinions expressed in this guest blog are the author’s, and do not reflect the official view of the U.S. Department of Defense. In February of 2008, I found myself riding in the back of an ANA ambulance with a wounded Afghan teenager. Shrapnel from a suicide bomber outside of Kandahar City had lodged itself in his neck. He was bleeding while trying to scream. I was holding him and trying to keep him calm, while the driver kept looking backwards toward me, as if to ask, “Is he going to die”? I could not answer that, because I did not know myself. What I did know was that a young man had been maimed, and I could not understand why. U.S. enemies seem to be competing to garner credit for last week's suicide bombing that killed seven CIA officers in Afghanistan. The varying claims of responsibility from Taliban groups in Afghanistan and Pakistan may be both complementary and competitive as militants seek to spread the word and attract fresh donations and recruits, analysts said Sunday. "It's a tremendous boost for any group out there that can claim killing CIA" officers, said Richard Barrett, coordinator of the United Nations Taliban and al Qaeda Monitoring Team. Details about Wednesday's attack are murky.